CASE Construction Equipment introduced the 4-wheel drive W9 in 1958 — today the company offers a full range of compact and full-sized wheel loaders for all applications, from road building to recycling centres, from urban construction to quarries. This year, CASE Construction Equip- ment is celebrating its 60th anniversary of wheel loader production, which started with the W9, the first CASE integrated four-wheel drive wheel loader introduced in 1958. The W10 and W12 four-wheel drive models and the front-drive W5 loader soon followed. The W series grew through the 1960s and 1970s, including the mammoth 15,000-kilograms W26, introduced in 1968. It was CASE’s first articulated loader and the largest wheel loader offered at the time. The W series loaders all featured cabs mounted on the front half of the machine. With the introduction of Model 621 in 1987, the entire CASE loader line graduated into the 21 Series, a more rugged design that featured modern rear-mounted cabs. The 21 Series models were developed under a new streamlined, cross-functional, concurrent process that became the guide for the rest of the company as it moved into the 21st century. Major innovations in productivity, serviceability and operator comfort continued, and this product line represented the first heavy earthmoving equipment to deploy a Tier 4 Interim solution without a particulate filter, using selective catalytic reduction (SCR) emissions technology, with the F Series. Several new models were added to the 21 Series, including a new line of compact wheel loaders. Jose Cuadrado, Vice President CNH Industrial Construction Equipment for Europe Africa and Middle East, commented: “The W9 marked the beginning of a long history of innovation pioneered through many generations of wheel loaders, culminating in today’s G-Series wheel loader range, introduced a revolutionary windscreen design and raised the bar on operator comfort. These machines have come a long way since the original models, and reflect the practical innovation CASE builds into its equipment to maximize performance and dependability." 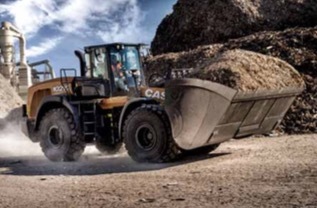 The latest wheel loader offering from CASE — The G Series — span 141 to 347 horsepower, with bucket payload ranging from 3.9 to 10.2 tonnes and bucket volume from 1.9 to 5.5m3. In the short time since their introduction, the G-Series have won several awards, including the prestigious Good DesignTM Award in the Industrial Category from the Chicago Athenaeum: Museum of Architecture and Design and The European Centre for Architecture Art Design and Urban Studies, and top new product recognitions from industry publications. CASE is celebrating the high quality of the latest generation of CASE wheel loaders with the launch of its ProTech protection plan, which covers powertrain and hydraulics for 1 + 3 years and 6,000 hours on all G-Series wheel loaders. CASE is celebrating the 60th anniversary of its wheel loaders at the Intermat 2018 show with a dedicated display on its stand. It is centred on a G Series wheel loader model bearing a commemorative livery specially developed for this year’s exhibitions, which includes a ‘60 Years’ logo embroidered on the headrest and applied as a decal on the bucket, as well as an Eagle tattoo on the hood. CASE Construction Equipment sells and supports a full line of construction equipment around the world, including loader/backhoes, excavators, motor graders, wheel loaders, vibratory compaction rollers, crawler dozers, skid steers, compact track loaders and rough-terrain forklifts. Through CASE dealers, customers have access to a professional partner with world-class equipment and aftermarket support, excellent warranties and flexible financing. CASE Construction Equipment is a brand of CNH Industrial N.V.